The theory of Initial Bipedalism, meaning that the first mammals were bipeds, is quite embarrassing because it just indicates the opposite of what most people usually admit : "Man is descended from some quadrupedal apes of the Miocene forests...". The theory of Initial Bipedalism leads us in fact to dissent from the current view of what might be called the "simian origin of humanity". It emphasized on the contrary that our common ancestor ( to all the mammals ) was bipedal and that the trait has been lost in other lineages, rather than gained in humans. How did our species really come to be ? We suggest that man’s ancestral line went through a former phase of living in the water before climbing ashore to become the biped hominid. This kind of species was a new fundamental ontogenesis, with morphogenetic and plastic effects. Bipedalism, basicranial flexion, encephalization, round skull and free-moving forelimbs, can be explained by this theory. The first hominid was born. Like the German anatomist Max Westenhöfer once asserted : man comes in fact from a stock peculiar to himself, connected with the root from which all the mammals have sprung ; modern man would hardly differ from this ancestral common prototype. In quadrupedal mammals, the preservation of the large brain is countered by the development of dentition, as jaws become more powerful. Quadrupedalism is a further development due to specialization ( like the tree-life in apes ). It is the derived strait versus ancestral features ( bipedalism, globular brain-form ). In this regard, the apes - and also the fossil-known hominids like the australopithecines - appear to be deshominized forms, branching out at several points from man’s family tree ! The theory of Initial Bipedalism allow us to reconsider all the different types of fossil hominians which were previously accepted as the supposed links between the Homo sapiens and his alleged quadrupedal ancestors. Such deshominized forms, which evolved from our direct ancestry, are quite naturally able to survive in remote parts of the world (wild men, "yetis"). 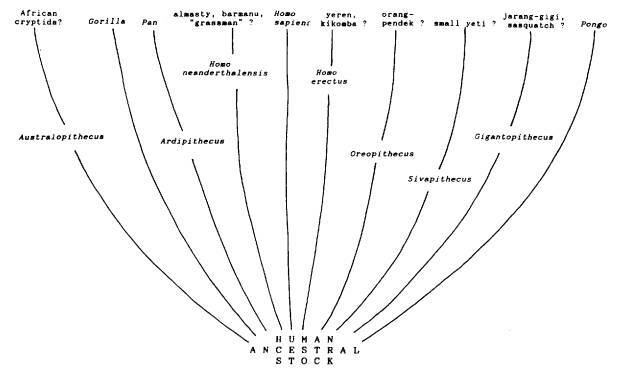 The following chronological table shows us the development of some lineages ( including apes ) from the human ancestral stock. We are indeed incorrigibly curious about our origins, and also suspicious when confronted with the commonly accepted ideas about human evolution. Above all, a free-thinking spirit, without preconceived ideas, is necessary for the study of our origin : it will be understood and explained only through an interdisciplinary research : palaeontology, embryology, comparative anatomy, physiology, genetics and cryptanthropology ! A theory, like Initial Bipedalism, is a good theory if it describes - and explains - a wide assortment of observations ; it must also be able to foresee the results of future investigations, discoveries and analyses ! Indeed, the hypothesis that the apes issued from bipedal ancestors becomes more and more relevant. We can emphasize that apes and monkeys are descended from terrestrial creatures which were more man-like than ape-like. In the case of Pan ( chimpanzee ), an ancestor was perhaps already found by the palaeontologists : Ardipithecus ramidus. Its thin enamy implies that it was a frugivor, like the extant African apes are. Its vertical insertion of the foramen magnum denotes its bipedalism. As a matter of fact, Ardipithecus may have been the bipedal antecessor of Pan, or at least it gives us a good indication of what could have been the aspect of this intermediary stage between the man-like ancestor and the today living chimpanzees ! Another fossil, Australopithecus anamensis, also biped, could have been at the origin of the evolutive radiation of all the other australopithecines. Contrarily to the usual cliché, the more ancient Australopithecus was the best biped. And the descending series ( A. afarensis, A. africanus, A. robustus and even "Homo" habilis) is composed of more and more quadrupedal forms, through tree-living habits and steadily continued deshominization ! If a descendant of the australopithecines is still living in the form of a "cryptid" ( yet unknown, hidden living creature ), it would certainly resemble a big ape. Together with the 2 ancient bipeds, Ardipithecus ramidus and Australopithecus anamensis, modern Palaeontology has determined further species of ancient apes which were able to stand erect and to walk on two legs : Dryopithecus laietanus and Oreopithecus bambolii. It can be now duly established that bipedalism in Primates is ancient and that diverse forms of bipedal beings once existed ( some of them are still surviving ). They branched out from a more bipedal prototype. Some palaeontologists claim that bipedalism appeared "several times", independently, in the course of evolution. This would be, of course, a "reassuring" solution, but inconsistent with the biological facts, in regard to embryology, physiology and comparative anatomy. It would also be in contradiction with the Principle of Parcimony ( Ockham’s razor ) that demands that the simplest explanation ( = Initial bipedalism ) should be preferred to the more complicated ones. We have to rethink our understanding of human origins, apart from today’s arbitrary rigid mindset. If taken seriously, the zoological evidence of an initial mammalian bipedalism would certainly challenge the currently dominant views about human origins.